Happy Monday friends! Did you guys have a good one? We had a big ol’ Vietnamese eating and drinking party on Saturday. According to Mike, these parties are called “nhậu.” Basically a bunch of people get together, drink and consume massive amounts of beer snacks. It’s kind of like going to an izakaya in Japan, or maybe heading to the bar for happy hour, only we did it at home since there’s no such thing as a Vietnamese bar around here. Funny fact about that: almost all of the Vietnamese restaurants around here are unlicensed because some Vietnamese people get angry when they drink. Just so we’re clear, I have no idea if any of this is true, but considering this theory comes from Mike–who actually is Vietnamese–I’ll take his word for it. Plus, there’s this pretty crazy video of some girls throwing down in a pho restaurant that kinda sorta supports his hypothesis. No word on if alcohol was served there or not. Anyway, we had a relatively tame night filled with our own version of nhậu food. These rolls definitely weren’t on the menu. 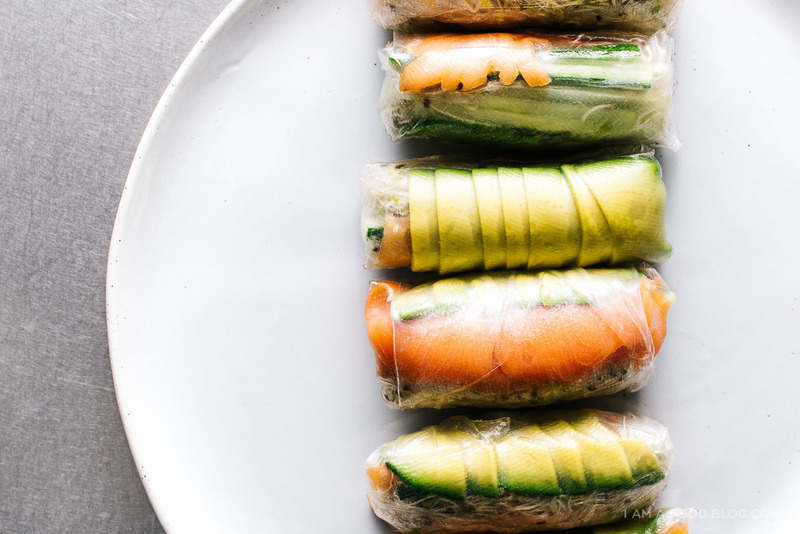 They’re so so far from the traditional idea of salad rolls that I think my Vietnamese Food Lovers Club card would have been revoked if I even mentioned them. They are delicious though and a quick and easy dinner for those of you who are still melting at the thought of turning on the oven in the August heat. Take a rice paper wrapper and completely submerge it in a bowl of hot tap water for 10-15 seconds. 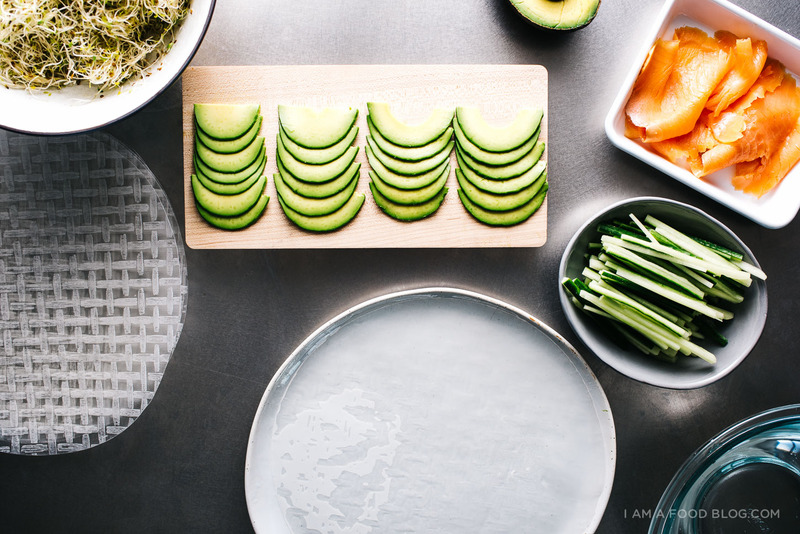 Place the wrapper on a plate or cutting board – it’ll continue to soften as your assembling your roll. 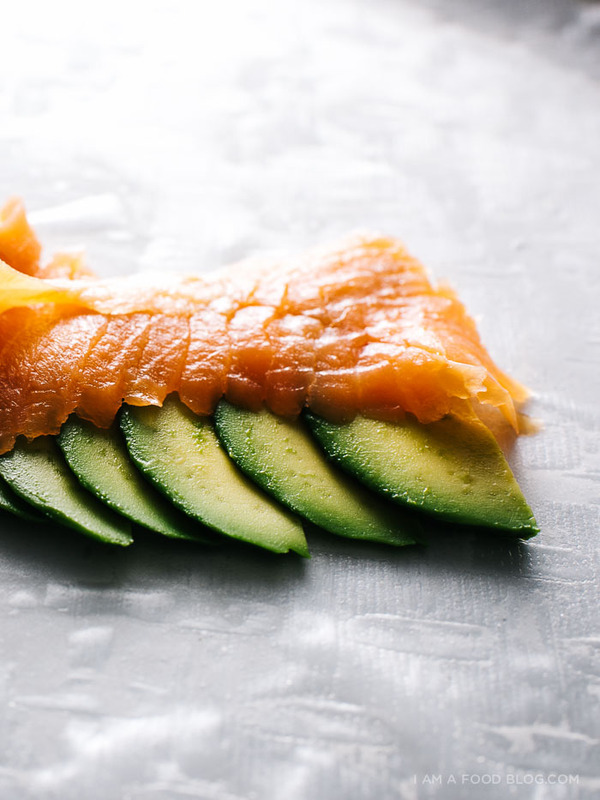 Add fillings as desired: avocado, smoked salmon, cucumbers, sprouts or noodles. Fold the bottom half of the wrapper up over the filling, hold the fold in place, fold in the sides and roll. Repeat as needed. Dip in the miso sesame dressing or fish sauce vinaigrette and enjoy! Use a mortar and pestle to crush the sesame seeds. Stir everything together, taste and adjust as needed. I want to be in your Vietnamese Food Lovers Club!!! Your summer roll creations always amaze me, Steph. 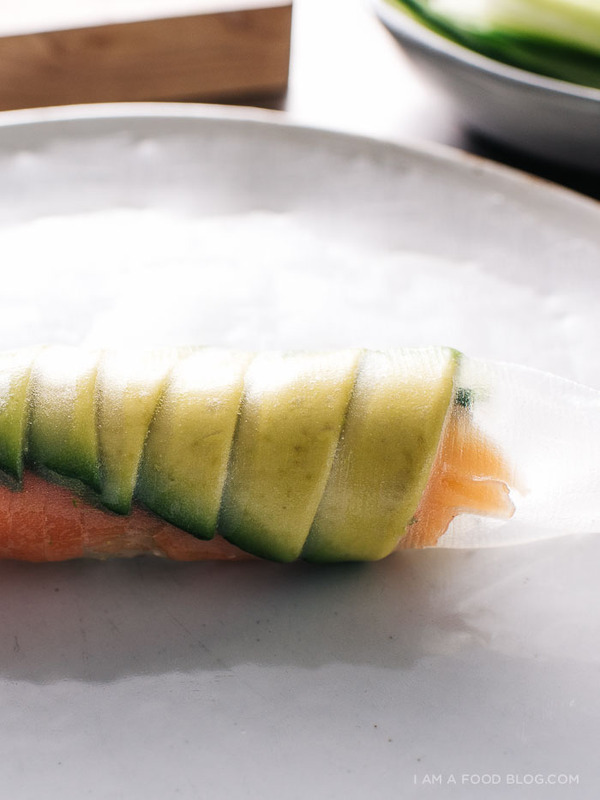 Smoked salmon, avocado and miso sesame sound incredible together. And your rolls are always SO beautifully wrapped! Something about those neat, chubby little rolls all in a row make my heart happier than anything. PS Mike’s theory cracks me up — yay for a non-angry low-key nhau! Hahahha. That link is INSANE! I watched it with Josh–it is so funny and crazy. Also, very into the psycho OCDness you have displayed here with the slicing. OMG…my friend and I just watched that video 3 times in a row. Holy ***…intense! I would absolutely love to attend your nhậu!! 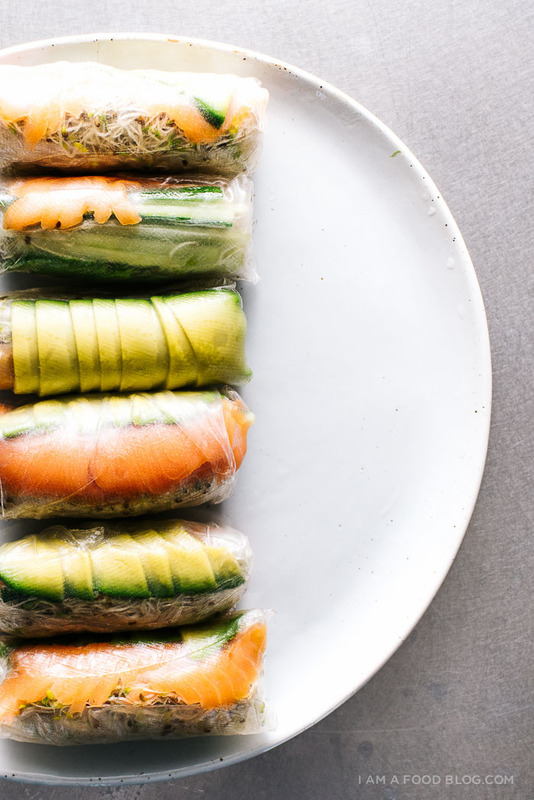 Especially if these summer rolls made an appearance! Yummy! 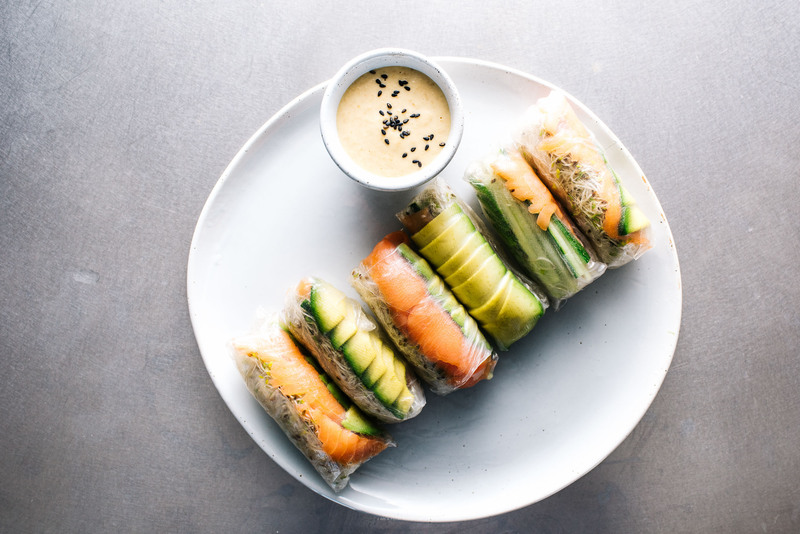 I love rolls…and avocado…and smoked salmon…so yeah, basically it’s a great combo. And I hate to say it, but that video was kind of really amazing to watch. (yes, I am a terrible person). HAHAHA OMG!! BEST POST EVER. Not only are these rolls amazing but that video. DYING. JUST DYING. 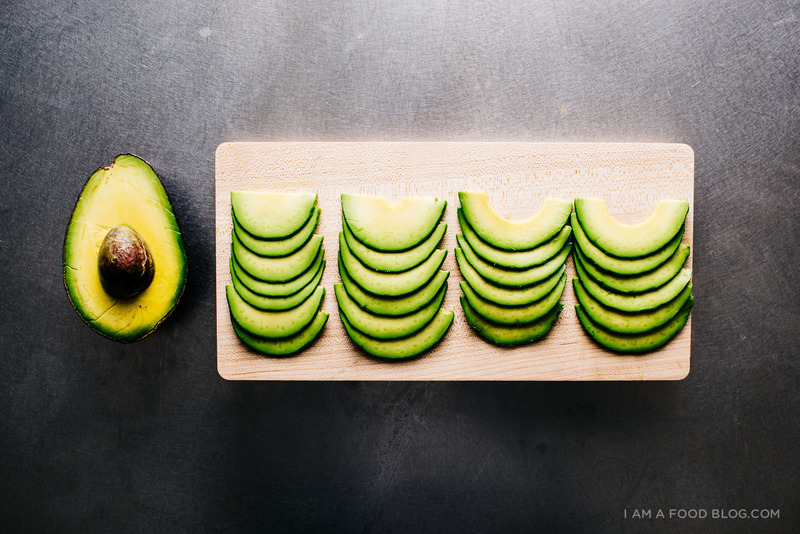 Ps – Those avo slices are perfect!! GORGEOUS GORGEOUS GORGEOUS! Need these immediately. I used to make summer rolls all the time with one of my exes, who called them “freshy rolls”. LOL. These are perfect. Oh I LOVE this idea. Perfect for warm temps and light summer eating! This recipe looks delicious. I have been wanting to try to make something similar at home, and this recipe just sold me to do so. :) Thanks so much for sharing! Gah! I have already spent too much time today not eating this. I want this immediately. wow you made the roll looks like an art piece! so pretty! When I make summer rolls they are never the same length, width etc! I suppose practice makes perfect. Love the idea of smoked salmon and avocado too. 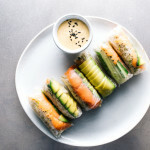 I’ve been looking for a simple Rice Paper wrap recipe–found it! Thx! Wow, these are so pretty. Little see-through packages filled with deliciousness. wow.. they look so perfect! I just made these! Though delicious, they were pretty hard to make because of how sticky my rice wrappers were! How did you keep them from sticking to everything? it helps if you keep your hands slightly damp and make them on a cutting board!